SV8CS - 2M DXCC (15 MAY 2008). Today received my 2m DXCC. That is a big event for me, after many years of trying on VHF. 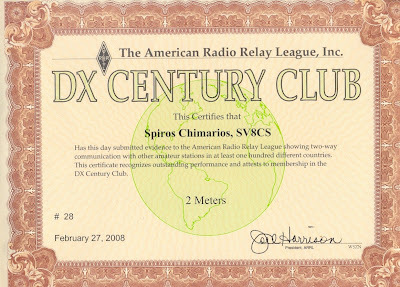 My 2m DXCC, is the 1st 2m DXCC in Greece and I like to dedicate it, to our SV VHF pioneer George SV1AB (sk). George SV1AB he is not now with us but he was the 1st SV radio amateur using his old equipment to make the 1st EME contacts on 2m . In this point I would like to thank all those radio amateurs who have helped me to get my 2m DXCC. Thanks to SV1AB, George - SV1AE, Socrates - SV1CC, Kostas - SV1BG, Bill (all SK’s) for my 1st point to point 2m qso’s (1969). Thanks to I0IJ/IG9 Tony - 9H1CD Henry - 9H1BT Paul for my 1st DX tropo qso’s (since1972). Thanks to SM7AED (Arne) for my 1st Es qso (1978). Thanks to ZE2JV,Ray for my 1st TEP qso (1978). Thanks to YO2IS (Julio) for my 1st M/S qso (1979 with cw tape recorder. Thanks to I2FAK for my 1st EME qso (JT65b) (2004). Thanks to my friends SV3KH,SV8RV,SV8IE,SV8RX,SV2JL,SV2DCD who have helped me in my VHF dxpeditions in the Greek mountains for contesting and DXing since (1974). Thanks to RA3AQ Dmitri and RU1AA Alex, for their technical support for my EME set-up. A BIG thank to all radio amateurs who had activated all those rare one DXCC countries with their dxpeditions, putting on the air all those rare calls without to consider lost time, money, personal sweat and family obligations. Thanks going also to BIG inventor Joe Taylor K1JT, whose the brilliant digital program (WSJT) gave me the chance to complete the last qso’s and obtain my 2m DXCC. Thanks also to DJ6QT and the German group for allowing me to operate in the 1st SV EME dxpedition outside of Greece on Madeira as CT3/SV8CS during CQWW contest 2005 (CT9L). Finally I thank also my friends IK2QEI and IK2SGC for helping me to operate 2m EME and 1st 6m EME dxpedition from Morocco as CN3A (2007). During my long VHF trip, I have used all kind of modulation, like CW,SSB,HSCW,FSK441,JT65b. At this time I need only the 12m dxcc to finish from 160m to 2m awards. Τα ραδιοερασιτεχνικα μου συγχαρητήρια Σπύρο!